Ballina Heritage Inn offers a full Breakfast room service (Mon-Fri), outdoor pool, guest amenity block, laundry facilities and seating areas outside the rooms overlooking beautiful gardens. Parking is convenient and situated outside your room along with the option of undercover parking for boats and trailers, motorcycles and a useful luggage storage facility. We also offer disabled access ground floor rooms with ramp access. Even though our Ballina Heritage Inn is close to the sea, we have a crystal clear, salt-water swimming pool for the use of guests. Self-service laundry facilities are available on site. We also offer a charge-back service from local restaurants for lunch or dinner. Like all the best accommodation in Ballina, we offer high-speed broadband Internet access and Foxtel cable TV with LED television set with DVD players in all our rooms. Reverse-cycle airconditioning units are guaranteed to keep our Ballina accommodation facilities cool throughout the summer months and warm in the cooler months. Corporate guests will be happy and are catered for with all our rooms having a large desk and lamp. Sofa beds and dining table and chairs are also available in most rooms for their convenience. Looking for Ballina Accommodation with a Full Range of Facilities? 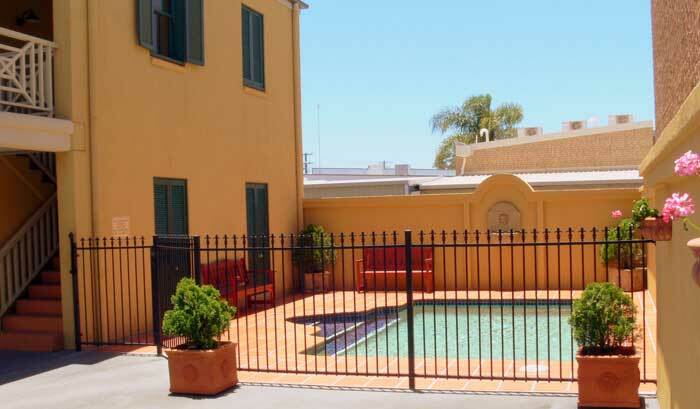 Just some of our facilities include high-speed broadband Internet, Foxtel cable TV, LED televisions, DVD players and an outdoor swimming pool.